Now includes EncConverter core version 4.0 and the extension for doing data conversion within OpenOffice/LibreOffice. This package provides tools through which you can change the encoding, font, and/or script of text in Microsoft Word and other Office documents, OpenOffice and LibreOffice documents, XML documents, and SFM text and lexicon documents. It also installs a system-wide repository to manage your encoding converters and transliterators (TECkit, CC, ICU, Perl, or Python based, as well as support for adding custom transduction engines). For developers, it provides a simple COM interface to select and use a converter from the repository. It is easy to use from VBA, C++, C#, Perl, Python or any .NET/COM enabled language. The core EncConverters assembly is fully integrated with SIL FieldWorks, Speech Analyzer, Phonology Assistant, Adapt It and OneStory Editor software. It provides the same system-wide registry of installed and available encoding converters for all of these user programs. Additionally the package includes some extra utilities such as a clipboard converter for manipulating text between cut and paste operations. Figure 1 shows the three distinct layers to SIL Converters. At the top are various client applications. These user-oriented programs use the EncConverters core assembly to provide encoding conversion and other transduction facilities to their users. The EncConverters core provides an abstraction layer so the client applications can access the various transduction engines without having to implement the interface to each one separately. The transduction engines are the server applications that provide the actual conversion/text processing capability. Using EncConverters to gain access to the different transduction resources available by writing to the single EncConverters’ interface. See this webpage for details and code snippets. This version (4.0) was released to fix various bugs including most significantly the removal of the core EncConverters assembly from the Global Assembly Cache. From v4.0 and following, client applications will redistribute the core assemblies ECInterfaces.dll and SilEncConverters.dll with their applications directly. They can still share the same global system repository of activated converters, but there will be less dependency between the various clients in terms of release requirements. As of v3.1.1, a new transduction engine was added that provides support for the webpage-based converters in the Scientific and Technical Hindi Google Group. The Files section of that group contains a number of webpage-based encoding converters and transliterators for numerous Indic legacy encodings. The conversion code embedded in these web-pages can now be used to convert data with any SIL Converters client application (e.g. the Bulk Word Document Converter) by using the new Technical Hindi Html EncConverter Add-in. To activate this new add-in be sure to check the Maps and Tables, Indic converters feature during installation. Once installed, you can read Help for Technical Hindi (Google group) Html Converter Plug-in (in Start, All Programs, SIL Converters, Help) for further instructions. The Bulk Word Document Converter was also updated to fix a few problems related to converting text that was inserted into a document a single character at a time (thru the Insert Symbol command). SILConverters 4.0 corresponds to the same version of the core EncConverters assembly as Fieldworks 7.1 and overcomes the uninstallation problem previously encountered in Speech Analyzer 3.0.1 and Phonology Assistant 3.0. If you uninstalled any of the applications which used the earlier version of the EncConverters core, it would become unavailable to the other applications that used the same, earlier version of the EncConverters core until an installation Repair was done. See this webpage for details. This new version solves that uninstallation problem. The Bulk Word Document Converter was enhanced for this new version by adding a search feature which will search your hard-drive for documents containing specific fonts to be converted. The TECkit Map Unicode Editor has also been enhanced to show character maps for both the left and right-hand side of a conversion so that a point-and-click approach to encoding conversion can be used in developing the map. You will need Administrator privilege on the computer to install this software. Software prerequisites—Necessary system updates and add-ons are installed on your computer. SIL Encoding Converters 4.0 Setup—Conversion applications are installed and conversion Maps and Tables are copied to your hard drive. SIL Converters for Office 2003—Currently this installer only installs an additional operating system update. 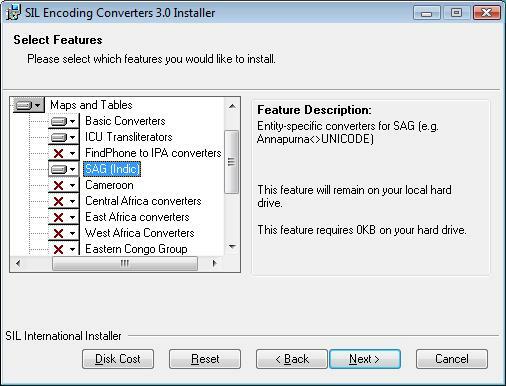 Converter Option Installer—A utility that allows you to activate the conversion Maps and Tables you want to use. Full installation instructions can be found here: SIL Converters 4.0 Installation. This document is intended to guide you through the Master Installer installation screens and initial SIL Converters 4.0 Setup. This guide may be sufficient for many users. However, to make full use of SIL Converters, you should download and refer to the Help for SIL Converters documentation (download below). This document gives installation help. This is the same information that is found here: SIL Converters 4.0 Installation. This document gives information about how to use the different utilities and applications for different text transduction applications. It is also available via Start / Programs / SIL Converters / Help / Help for SIL Converters, but you must use a PDF reader (e.g. Adobe Acrobat) to view it. This version of SILConverters uses the same version of the EncConverters core as FieldWorks 6.0. This download is recommended for users that have a very good internet connection and want to download an installer that has all potential prerequisites and can be run off-line. This is also recommended if you intend to install SILConverters on multiple such machines since this link will download the total install set (including all required components). Please note, however, that we strongly recommend using the newer version from this page. This section describes the encodings, font names, and converters contained in the different Maps and Tables packages available in the SILConverters 3.1 installer. You can check below for the fonts/encodings that you are interested in to see which Maps and Tables package to install. Most end-users are interested only in a small number of encodings. Typically, computer support people have created TECkit maps and/or CC tables for the various encodings used in each entity, alleviating most end-users from having to create their own maps and tables. Because there are hundreds of possible encoding converters and transliterators that different end-users may be interested in, they are packaged into logically-related groups of converters and are available via a two-step process. 1) Use the SILConverters installer to install the package(s) of converter likely to be useful to you (e.g. based on your entity). During installation, all the converter maps/tables in the selected package(s) will be installed into a fixed location on your computer (i.e. 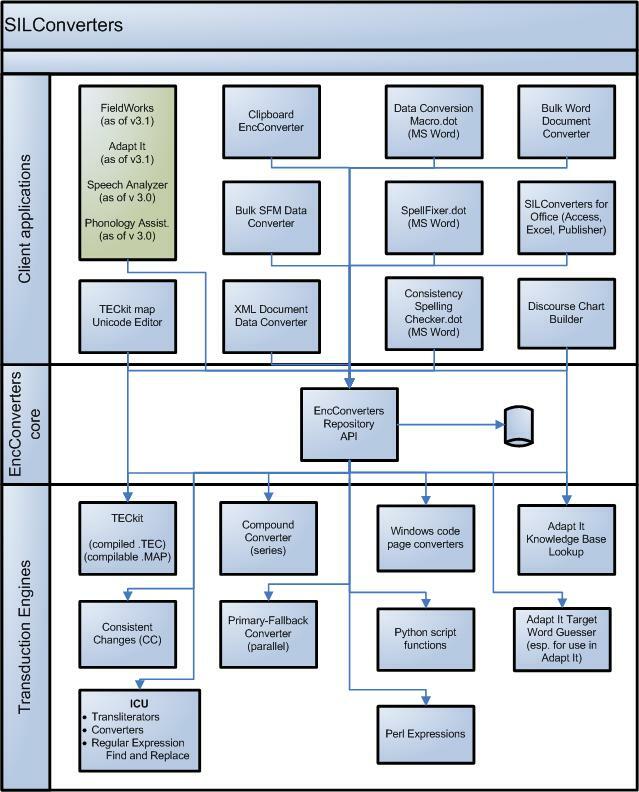 C:Documents and SettingsAll UsersApplication DataSILSILConverters31MapsTables on Windows XP or C:ProgramDataSILSILConverters31MapsTables on Vista). 2) Use the Converter Options Installer application to install the few applications you want into the EncConverters’ system repository. They become available to SILConverters client applications. Installing maps and tables onto your computer with the SILConverters installer (step 1 above) will not make them available to SILConverters client applications unless you explicitly add them to the system repository using the Converter Options Installer or some other mechanism (see Adding Converters to the System Repository in the Help for SILConverters document). Configuration information for the following ICU transliterators are for Unicode-encodings only. These are not the only transliterators available via the ICU Transliterator transduction engine, but are only a few of the pre-defined latinizing (or romanizing) transliterators that can be useful in different client applications for different ranges of Unicode. These transliterators can be daisy-chained together to transliterate between non-Latin scripts using a Compound meta-converter. For example, chaining the Devanagari-Latin transliterator (in the Forward direction) with the Arabic-Latin transliterator (in the Reverse direction) gives a ‘Devanagari-Arabic’ transliterator. Frequently Asked Questions and Known Issues concerning conversion of legacy data to Unicode. Step-by-step instructions on how to convert Microsoft Word, text or Standard Format (sfm) documents that use SIL IPA93 fonts in order to use Unicode fonts. In our workflow, should we standardize on composed (e.g., NFC) or decomposed (e.g., NFD) character encoding for our Unicode data?